In a large c pot, heat the olive oil over medium. Add the onion, celery, and carrots. Saute for 5 minutes or until the veggies begin to soften. Next, add in the garlic and saute for another 30 seconds. Then add the tomato paste, vegetable broth, diced tomatoes (with the juices from the can), and oregano. Bring to a boil and then reduce to a simmer. Let simmer for 20 minutes. Add in the stems of spinach, kidney beans, chickpeas, and pasta. Let cook for another 10 minutes. Finally, add the swiss chard leaves and let cook for 30 seconds or just until the leaves start to wilt. Remove from heat. Add salt, pepper, and red pepper flakes to taste and top with parmesan. 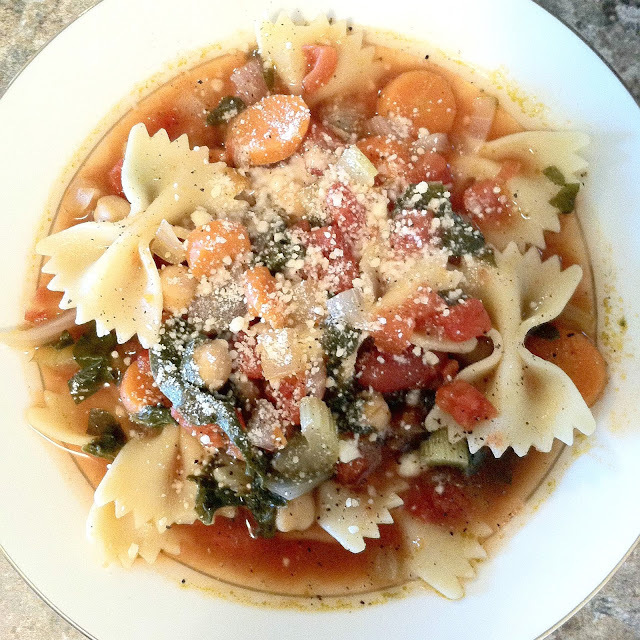 Combine everything (minus the uncooked pasta) and simmer for four to five hours on low to medium heat or until the chickpeas begin to soften. Boil the pasta on the stove according to the directions on the box, drain, and combine. Top with parmesan to garnish and serve.